The ovaries are women's endocrine and reproductive centres. Both the trophicity and the function of all organs and tissues that in women's bodies characterize them as women depend on the ovaries. The cyclical pattern of the ovarian function determines the typical cyclical feature of the female nature and physiology. All estrogenic and/or estrogenic-progesteronic cyclical actions generate innumerable also cyclical transformations in the woman's sexual organs, in her physiology and in other parts of her body. The function of the female gonads is under the control of the hypothalamus-hypophyseal system (which they interact with through intricate feedback mechanisms) and also of specific intra-ovarian factors. The latter, among other still non-precisely identified actions, modulate the response of the ovaries to the FSH (follicle stimulating hormone) and LH (luteinizing hormone). Briefly, we can say that the physiology of the female gonads depend on the actions of the hypophyseal gonadotropins (FSH and LH), of the sexual hormones produced by them and of still unknown intra-ovarian factors. The biological course of everything that is characteristically female in the woman's body is determined by the biological course of the ovaries throughout life, since they are the basic source of estrogens - the principal hormones of femininity at the somatic level. In this way, it is undeniable that, during most of women's lives, their gonads are much more important as producers of estrogens (and also of progesterone) than of oocytes (the female reproductive cells). I have already suggested that, at a metaphysical level, the ovaries can be regarded as the manifestation of the female principle at the gonadic level, and the estrogens produced by them as the main manifestation of the same principle at the endocrine level. The other endocrine manifestation of the female principle is progesterone. Most of the ovarian volume is due to the functional or cortical layer. 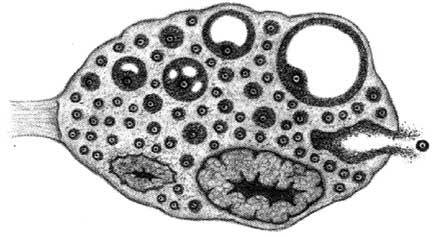 It is in this layer that, in the middle of a connective stroma also endowed with some endocrine capacity, the ovarian follicles - the basic functional structures of the female gonads - are found. In these follicles, the endocrine and reproductive functions of the ovaries are histologically and functionally linked, because the granulosa and the theca cells that surround the oocytes are the most important structures responsible for the estrogenic synthesis. As in the synthesis of the sexual steroids the female hormones ( estrogens ) are produced having male hormones (androgens) as precursors, a functional division is established between the cellular elements that constitute the granulosa and the theca. 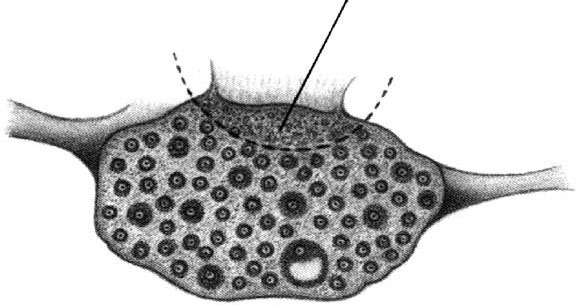 The theca cells, stimulated by the LH, produce the androgens, which are then transferred to the granulosa cells. These ones, under the stimulation of the FSH, turn the androgens into estrogens. When the maturation of a follicle continues normally (which only happens to a minority of them), the multiplication mostly of the granulosa cells makes their estrogenic production become increasingly higher. After ovulation, also as a result of the hypophyseal ovulatory peak of LH, the granulosa and the theca cells undergo accentuated morphological and functional modifications, giving rise to the corpus luteum. The former are turned into the granulosa-lutein cells, and the latter into the theca-lutein cells. In the corpus luteum, the granulosa-lutein cells produce mainly progesterone and some estrogens, while the theca-lutein cells produce mostly estrogens. Only a few follicles complete their entire development, being able to produce high levels of estrogens, ovulate and become luteinized. The great majority of them are condemned to involution and disappearance through the process of follicular death or atresia even before completing their first stages of growth. * The main causes for follicular death or atresia are: 1) an insufficient transformation of androgens into estrogens by the granulosa cells, causing an androgenic accumulation around the follicle; 2) a reduction in the response of the granulosa cells to the FSH. As the formation of new follicles is impossible during women's lives, the phenomenon of follicular atresia gradually leads to the depletion of the female gonads. This depletion is completed about the age of 50, culminating with menopause. Thus, the organs that are the woman's endocrine and reproductive centres are paradoxically condemned to precocious depletion and aging. As a result of the post-menopausal estrogenic deficiency, all organs and tissues of the woman's body that depend on the estrogens undergo atrophy. From the archetypal point of view, maybe we can say that the ovaries, by means of their hormones, reflect not only the two sides of female nature (the aphrodisiac and the maternal ones), but also the male component of this nature. The estrogens can be regarded as the main endocrine manifestation of women's aphrodisiac side, since they constitute the factors responsible for their sexual maturation and for the trophicity and good shape of everything that is typically female in their bodies. Progesterone, apart from its fundamental importance in the gynecologic endocrine balance, in a way can be regarded as more related to women's maternal side. On the other hand, the androgens (which, as we have seen, paradoxically and curiously are the biochemical precursors of the estrogens ) can be related to the obscure women's male component. Note: * Follicular atresia - a physiological process by which most of the ovarian follicles undergo regression, shrinkage, death and disappearance along several stages of their growth. The ovary (lower left, light object) and its relationships with the uterus (right), Fallopian tube (upper left and top) and ligamentary structures (above ovary). 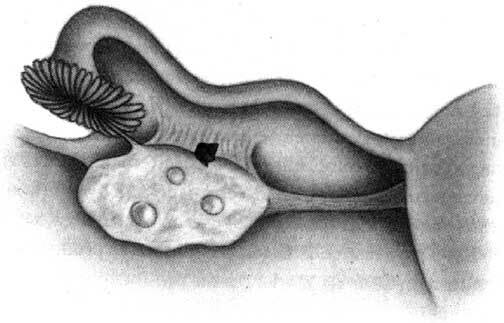 Schematic drawing of the ovary showing the enormous development of the cortical or functional layer, replete with follicles, and the atrophic remnants of the medular portion. 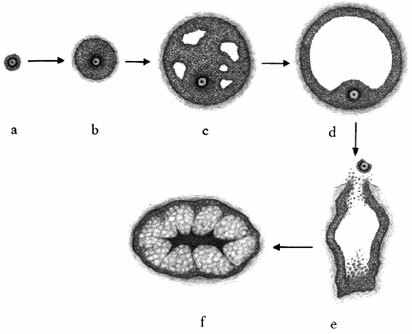 Schematic drawing of the ovary showing the sequence of events that characterize follicular growth, ovulation, formation and involution of the corpus luteum. Folicular development, ovulation and corpus luteum. The article above is an excerpt from my book "Os Órgãos Sexuais Femininos: Forma, Função, Símbolo e Arquétipo" ("The Female Sexual Organs: Shape, Function, Symbol and Archetype"), published by Imago Editora, Rio de Janeiro, 1993. For information on the book, see page http://www.nelsonginecologia.med.br/orgaos.htm, from my Web site http://www.nelsonginecologia.med.br.